MomsRising.org | Can FMLA be improved? You bet Jurassican! Can FMLA be improved? You bet Jurassican! Back in 1993 two HUGE things happened. 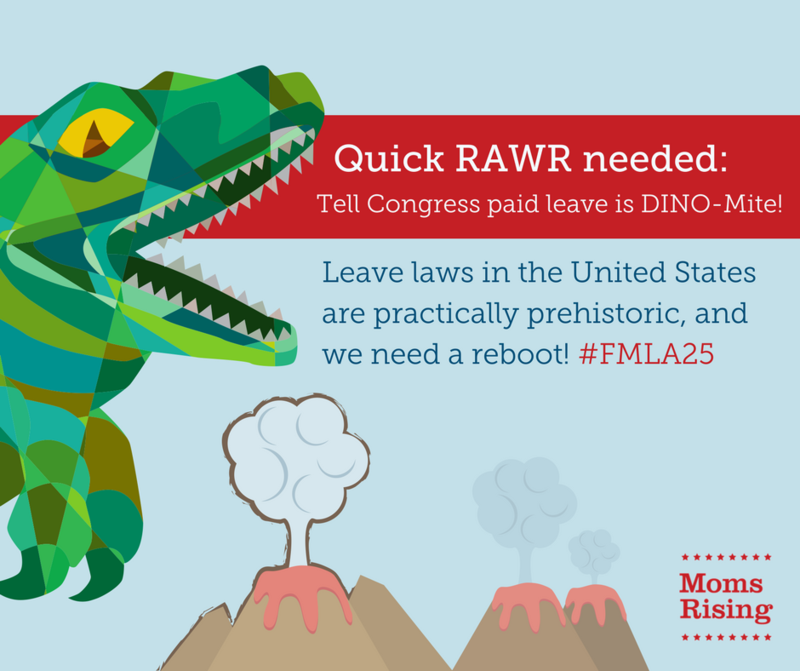 The Family and Medical Leave Act (FMLA) was signed into law and the movie Jurassic Park broke box office records. Now, 25 years later Jurassic Park will see its second reboot--with new and improved dinosaurs and modernized special effects! But our UNPAID national family and medical leave laws are stuck in 1993 and haven’t evolved to meet the needs of contemporary working families! → Tell Congress, our family and medical leave laws need a reboot too. We need PAID family and medical leave so all people can care for their families without fear of losing their job or damaging their family's finances. The Family and Medical Leave Act (FMLA), which turns 25 in just a few weeks, is an important law that has been used over 200 million times and has helped many families. But (big, Brachiosaurus-sized BUT here…) it was always meant to be a starting point, not the stopping point. Here’s why: It doesn’t cover all working people and the fact that it’s unpaid means millions who are eligible to use FMLA can’t because they can’t afford unpaid time away from work. Meanwhile, only 15% of working people have access to paid family and medical leave through their employer right now. Working families need a paid family and medical leave policy that is more than just maternity and paternity leave. We need an insurance plan that provides a meaningful length of leave, is accessible to all working people, covers all families, and is affordable, cost-effective and sustainable for workers, employers, and taxpayers.